If you experience ringing, buzzing or clicking in your ear, or if you hear a whistling or hissing sound, you are not alone. Ringing in the ears -- sometimes referred to as tinnitus -- is common, according to MedlinePlus. It may affect one or both ears, and it may be constant or intermittent. It’s not medically serious, but it can be emotionally distressing. There is no one standard cure for the condition, but some people who suffer these symptoms are deficient in certain nutrients. Bringing your diet back into balance may help to alleviate these phantom sounds. Ear ringing, or tinnitus, is not a medical condition but rather a symptom of an underlying problem. Often, it indicates that you have damage to the little hairs inside your ears and they are giving off random signals, which your brain interprets as sound. High blood pressure, high blood sugar or abnormalities in the little bones inside your ear may be a root cause of ear ringing. Atherosclerosis, tumors, sinusitis or any condition that causes fluid buildup in your ears also may cause ear ringing. In addition, age-related hearing loss can progress to tinnitus over time. Sometimes the problem is neurological — an error in the pathway between the ear and the brain or in how the brain processes the signals from the ear — so treatments for neural disorders sometimes help with tinnitus. Nutritional deficiencies related to these diseases and conditions may contribute to ear-ringing symptoms. Some researchers have explored zinc supplements as a therapy to alleviate ear ringing. 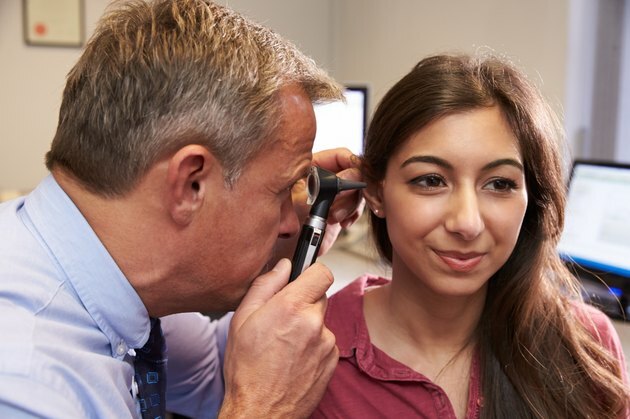 To test the theory that low zinc levels might be an underlying cause, researchers at Gulhane Medical School in Etlik, Turkey pre-tested a group of 40 men and women suffering from severe tinnitus to determine their zinc levels. Only six were hypozincemic and seven had slightly low zinc levels. The patients then received daily zinc supplements of 220 milligrams over a period of two months. The results, published in the October 2002 issue of "Auris, Nasus, Larynx," indicated that 57.5 percent of the study participants reported some relief of their symptoms, but the rate of improvement as measured by the researchers was not significant, except among the elder participants in the group who had a dietary deficiency of zinc. Many tinnitus patients have a vitamin B--12 deficiency. The tricky thing is, this vitamin is stored in your liver, so the deficiency does not become apparent until about two years after your dietary intake becomes insufficient. Vegetarians are particularly at risk because the only natural sources of vitamin B--12 are animal proteins. For patients severely lacking in vitamin B--12, monthly injections are the standard treatment, but oral intake of 1,000 to 2,000 micrograms daily is an alternative. Consult your doctor before beginning this or any other vitamin or supplement therapy because there is a potential for interaction with other medications. Both high and low blood sugar can cause or exacerbate ear ringing. Even if you avoid starchy foods, such as pasta, white bread and potatoes, you may experience unstable blood sugar If your diet is deficient in complex carbohydrates. High-fiber foods, such as whole grains, beans and lentils, are complex carbohydrates that break down more slowly and help keep your blood sugar more stable, which may help to ease your tinnitus symptoms. Although some online sources advocate ginkgo as a remedy for ear ringing, clinical research does not fully support the theory that this dietary supplement relieves tinnitus symptoms. Some small studies have found some benefit, but a large study with 1,121 participants conducted in 2000 by researchers Shelley Drew and Ewart Davies at the University of Birmingham in the United Kingdom concluded that tinnitus sufferers who received 12 weeks of treatment with ginkgo biloba extract three times daily for 12 weeks experienced no greater relief than people in the same study who received a placebo.